Originally named the Corps of Discovery, the 1803 expedition led by Lewis and Clark came in contact with people and places never before seen, and returned with stories that Americans in the East could hardly believe. On this map, the outbound leg of the expedition is red and the inbound route is blue. Even before Jefferson had completed the Louisiana Purchase, he had begun to make plans for a bold journey to explore the vast interior of North America that remained completely unknown to American citizens. That plan took on new importance once the United States had acquired the huge new territory from France. 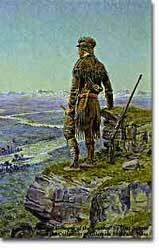 In May 1804, a group of 50 Americans led by Meriwether Lewis, Jefferson's personal secretary, and William Clark, an army officer, headed northwest along the Missouri River from St. Louis. Their varied instructions reveal the multiple goals that Jefferson hoped the expedition could accomplish. While trying to find a route across the continent, they were also expected to make detailed observations of the natural resources and geography of the west. Furthermore, they were to establish good relations with native groups in an attempt to disrupt British dominance of the lucrative Indian fur trade of the continental interior. In mid-October, 1805 William Clark entered into his elkskin-bound diary — a map of the Columbia River. 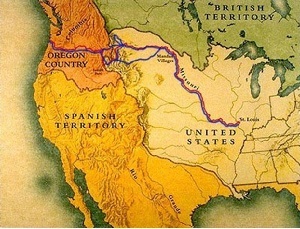 One of the purposes of the expedition, which was not realized, was to find a water route across the entire United States. By mid-October 1804, the Lewis and Clark expedition reached the Mandan villages on the banks of the upper Missouri River in present-day North Dakota. Here they found several large, successful settlements with an overall population of about 5,000 people. The Mandan villages were an important trade center that brought together many different native groups as well as a handful of multilingual Frenchmen. The expedition chose to spend the winter in this attractive location and it proved to be a crucial decision for the success of their journey. During the winter they established good relations with the Mandans and received a great deal of information about the best route for heading west to the Pacific Ocean. 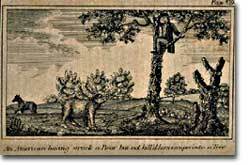 The expedition also hired several of the Frenchmen who lived among the Mandans to serve as guides and translators. Along with them came a fifteen-year-old Shoshone named Sacajawea who was married to one of the Frenchmen. Her knowledge of the west and language skills played an important role in the success of the expedition. Additionally, the presence of Sacajawea and her baby helped assure other Indian groups encountered further west that this could not be a war party. This painting by Olaf Seltzer, called Lewis' First Glimpse of the Rockies, illustrates a remarkable moment in the famous journey to the Pacific. From the Mandan villages the now enlarged expedition headed west to cross the Rockies, the highest mountain range in North America. 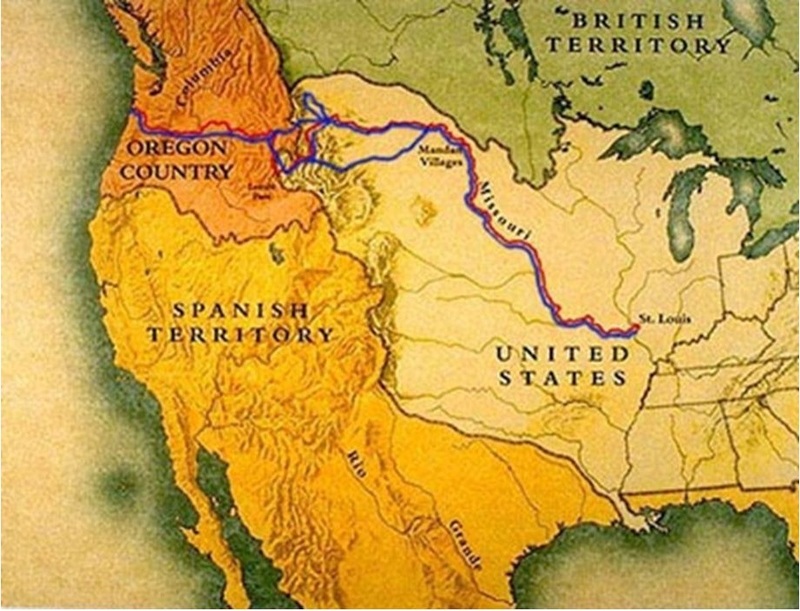 By the winter of 1805 they had reached the Pacific Ocean via the Columbia River, becoming the first U.S. citizens to succeed in a trans-continental crossing north of Mexico. They were not, however, the first whites to accomplish this feat since Alexander Mackenzie had done so for a British-Canadian fur-trading company in 1793. Nevertheless, the Columbia River proved a much easier route than the one Mackenzie had taken a decade earlier. When the long overdue expedition finally returned to St. Louis in September 1806, they were celebrated as heroes who had accomplished an extraordinary feat. The expedition combined several qualities from scientific and military to trade and diplomatic, but the underlying motivation was prompted by Thomas Jefferson's widely shared belief that the future prosperity of the republic required the expansion of yeoman farmers in the west. 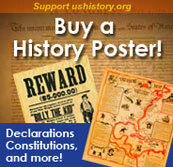 This noble dream for what Jefferson called an "empire of liberty" also had harsh consequences. For instance, Fort Clark was soon established at the Mandan villages. At first it provided the Mandans with a useful alternative to trading with the British and also offered military support from their traditional native enemies the Sioux. 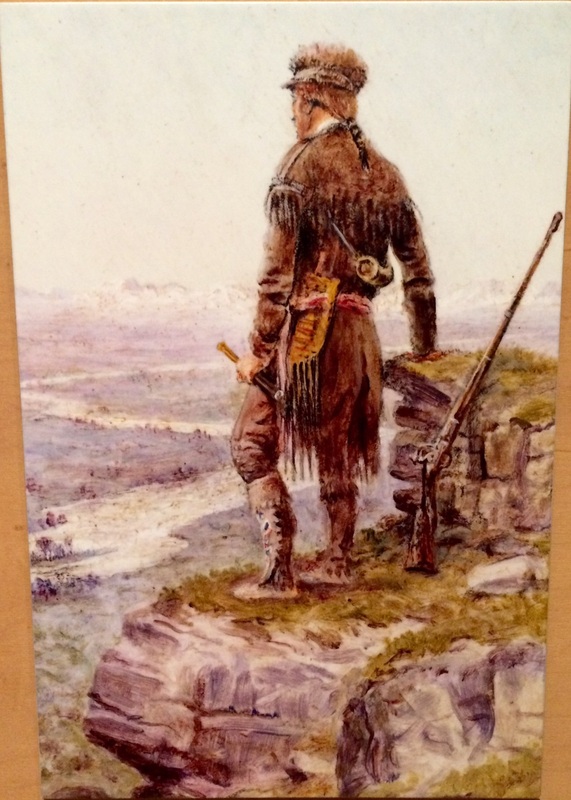 During his travels across the continent with William Clark and the Corps of Discovery, Meriwether Lewis fell 20 feet into a cavern, got poisoned and was shot in the thigh. 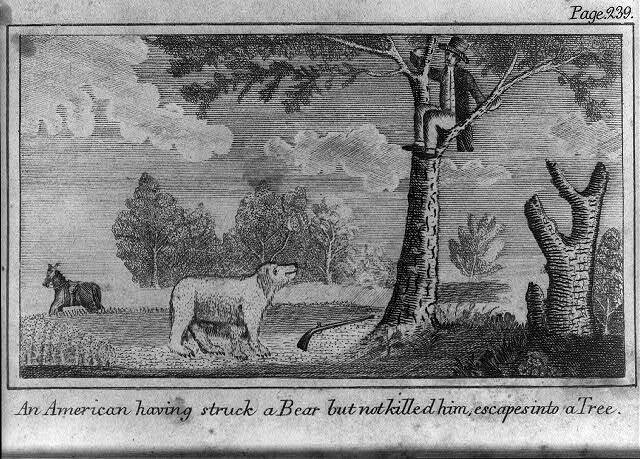 In this engraving, An American having struck a Bear but not kill'd him escapes into a Tree, the American was none other than Meriwether Lewis. However, Americans at the fort unwittingly brought new diseases to the area that decimated the local native population. Where the Mandans had a thriving and sophisticated trading center when Lewis and Clark arrived in 1804, by the late 1830s their total population had been reduced to less than 150. The nation's growth combined tragedy and triumph at every turn. A widow, with 5 children, the youngest only 6 years of age, walked across the American prairie pushing all her family possessions in a handmade, wooden handcart. After much trouble and travel, Elizabeth, with all of her children still alive, arrived at her destination, the Salt Lake Valley. Read about the trials of a mother striking out into the West to make a new life for her children. This account was written by her granddaughter. When she gained her freedom in 1832, ex-slave, Mary Fields looked to the western territory for her new life. Ladies in the wild west had to be tough to survive. Mary had a bet that with one punch, she could knock out any man willing to take her up on the deal. Find out more of her wild stories of her adventure in the west. Discover more than just the discoverers at this attractive and thorough website. Informative text, colorful images, and valuable primary documents help to present a comprehensive picture of this historic expedition. Browse through entries from the explorers' journals, meet the rest of the group, explore the geography of the route, and consider some of the historical issues and questions raised by the trip itself. If that isn't enough, branch out to learn about other aspects of contemporary history, Native American relations, natural history, and technology. An almost overwhelming resource. Sacajawea's name was found spelled 14 different ways on maps, in journals, and in letters. Did you know that depending on how her name is spelled, it could mean either "boat pusher" or "bird woman?"